So which teams have the most expensive tickets in the NFL? Below is data for the 2008 NFL season compiled by Team Marketing Report. A few observations before we get into the numbers. Kudos to the Buffalo Bills for having both the lowest average ticket price ($51.24) and lowest Fan Cost Index ($298.96). The Bills are the only team to have a FCI below $300. I hope that change if the Bills start to play more games in Toronto to lure more corporate dollars. The NFL average for ticket price is $72.20 and $396.36 for Fan Cost Index. Expect the Giants, Jets and Cowboys average ticket price to go up dramatically next season once they move into their new stadiums. The Chiefs are absolutely ripping off their loyal fans. Top 10 in league for average ticket price and bottom 5 in league for performance. It’s only 450 miles from Boston, Massachusetts to Buffalo, New York, a relatively short distance between NFL cities. But it will still cost you twice as much to attend a Pats game as it will a Bills game. Patriots fans sure are paying for their team’s success on the field. The Pats average ticket price is 30% higher than the next closest team (Bucs) and their Fan Cost Index is $100 more than the next closest team (Bears). Now I know what Bill Simmons was talking about. * Average Ticket Price – weighted average of season ticket prices, not including premium seating. * Fan Cost Index – TMR’s trademarked stat. Price of 4 adults to attend that includes 4 tickets, 2 beers, 4 soft drinks, 4 hot dogs, 2 baseball caps, 2 programs and parking. * The data is from Team Marketing Report. College football Bowl Games have a rich tradition of really bad names starting with the Poulan Weedeater Bowl. That tradition will carry on this year with the magicJack St. Petersburg Bowl. magicJack is a phone company based in Florida who agreed to a 1-year sponsorship deal for the bowl game. The St. Petersburg Bowl is in its first year and will match up a team from the Big East and Conference USA. The magicJack St. Petersburg Bowl will be played on Saturday, December 20th on ESPN. Why can’t we have a college football playoff? “It’s too simplistic to say, ‘Let’s have a playoff.’ We have far too many considerations in college athletics than just the entertainment value.” – Big 12 Commissioner Dan Beebe quoted on “Big 12 Showcase” for Fox Sports Southwest. What are the reasons we can’t start a college football playoff? No really, I’m curious to know. I’ve heard it will add too many games to the season, student-athletes will miss too much class time, fans won’t have time to travel to the games, or they won’t have the money to travel to multiple games. I have heard that teams will only schedule cupcakes in order to make it into a playoff and that a playoff would ruin the regular season. What I haven’t heard yet is anything that holds water. I haven’t heard one truly good reason not to have a playoff. I certainly have not heard how the bowl games are better than a college football playoff at deciding a national champion. The reason we don’t have a college football playoff is the “old boys network” who run the bowl games are still making a lot of money. And those fellas have a lot of influence in the college football world. They have the Conference Commissioners and University Presidents on speed dial, and no change is going to happen easily without them on-board. And they have no incentive to change, because they are doing just fine with the current bowl system. Doing just fine. Rather than evolve and create something truly notable, the big cigars that run the bowl games are content to sit on top of innovation and count their money. The change won’t occur until enough of that network is put out to pasture and a new breed comes in who’s not afraid to change. The good news is that I think that change is coming to college football very soon. So help me figure this out. Give me a few reasons why the bowl system trumps a playoff. 1. A true National Champion is crowned on the field. 2. All of the top teams get to compete for a National Championship. 3. College Football will make a ton of money. 4. Polls and ratings will no longer decide which teams play in the Championship Game. 1. Student-Athletes will miss too much class time. 2. The regular-season will be made meaningless. 3. The season will be too long. 4. Fans will not be able to travel on short-notice in a playoff format. 5. The current bowl system will die. That’s the reaction that most people are having to the news that GM is ending its 9-year relationship with golfing megastar Tiger Woods. Mr. Woods endorsed GM’s Buick brand. GM announced it was ending their endorsement deal as part of the on-going cost cutting measures at the struggling auto giant. GM says the separation is amicable and also being done so Tiger can spend more time with his family. I’m not buying that last part. Yes, I know Tiger wants to spend more time with his family, but I don’t think GM was keeping him from doing that. That part of the statement was just a cover to make it look less like GM is dumping Woods. Let’s be clear here, General Motors is dumping Tiger Woods as an endorser. Are they doing it because Tiger is not an effective endorser for them? No, although they probably suffered a bit this past year with Tiger on the shelf after knee surgery. The reality is GM just can’t afford these type of luxuries anymore, so they have to cut loose one of the top sports brands on the planet. Companies have to make these type of decisions when times get tough, and this is just part of the way things will go in the sponsorship world now that the economy is in full recession. How does Tiger react to this news? I’m sure he’s a little shocked and maybe a bit hurt, but probably not devastate. He knows GM is cutting him because they are failing as a business, not for something that he did. But it still has to sting to be dropped after almost a decade working together, and I’m sure there will be some lingering doubts about his other deals. What if Nike hits a rough patch? Can Gatorade afford to keep pushing Tigerade, which is just Gatorade rebranded, in a shrinking sports drink market? Tiger is one of the top pitchman today, but even he’s not immune from the economic downturn. What is next for Tiger & GM as they head their separate ways? General Motors is in survival mode, they’ve already eliminated their ad spending on the Superbowl. I expect them to continue to slash non-essential marketing costs, so all of their sports sponsorships will be in jeopardy. They are saying they are still committed to sponsorship of the 2010 Vancouver Olympics, but I wouldn’t cash that check yet if I was VANOC. GM is going to have to make some very tough choices with their marketing expenses, and some of the decisions they might not get to make themselves. I expect Tiger Woods to rebound from this setback rather quickly. This is the off-season for golf and Tiger is not coming back until The Masters in April. But assuming his knee is fully healed by then, he should pick up where he left off as the most dominant golfer in the history of the sport. That means that by the end of 2009 new sponsorship deals will be lining up to get a piece of Tiger, even in a down economy. How would Tiger look in a Lexus as a pitchman for Toyota? Or perhaps he goes the luxury route and inks a deal with BMW or Mercedes Benz. Regardless I expect Tiger to land on his feet and back behind the wheel of another auto endorsement deal very soon. You won’t be seeing Tiger pitching Buick anymore, his endorsement deal with GM is done. Update: Tiger Wood’s agent, Mark Steinberg of IMG, is now saying it’s “highly unlikely” that Tiger will sign up to endorse another car company in the “near term”. Nice try by Mr. Steinberg, but I’m calling BS on this. I think Tiger is locked up by Lexus or Mercedes in next 18 months. Mark it down. It took a little while post-Beijing for the Michael Phelps endorsement sweepstakes to really heat up, but it appears the swimming phenom is finally starting to hit his stride. Subway signed Phelps to an exclusive fast-food deal that prevents him from pitching any other fast-food chains. Phelps joins football player Reggie Bush on the Subway roster of sports stars, Bush has been pitching Subway since his rookie year in the NFL. 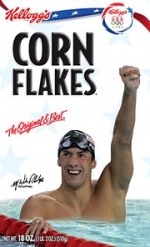 Phelps also recently signed a deal with Kellogg’s to appear on the cover of their Corn Flakes box. These two deals are in addition to an array of endorsement deals that Phelps already has, including: AT&T, PowerBar, Speedo and Visa. Expect young Mr. Phelps to land a few more key deals over the next 12-months, including the possibility of a financial institution (bank) and a car maker (if they have any money left). He is also a prime candidate for an upgrade on his apparel deal. Nike & Adidas both have a lot of money to try to lure Phelps away from Speedo, even if Speedo’s suits are superior to Nike. So expect to see Michael Phelps shaking a few hands and posing for photos. Sponsors have not forgotten the enormous Worldwide exposure that Phelps drew during the recent Olympics, and the 2012 London Olympics are only 3 and a 1/2 years away. 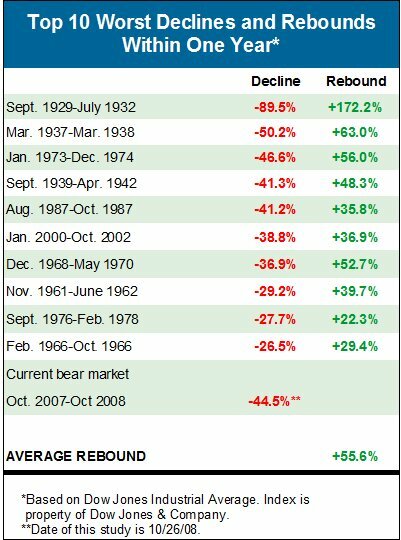 When will the stock market rebound? My broker sent this chart to me today in an email. He said it was “positive news” and a reason for “hope”. I like his enthusiasm, but long for the days in our relationship when he played a role that was more Warren Buffet than Tony Robbins. I guess these days his only hope is to go the Dr. Phil route with clients; laying us down on the couch to hear our pain and then trying to fix it. When will the Stock Market rebound? The trillion dollar question. Our current “decline” surpassed 50% this week, so we’re not in the midst of the worst decline since the Great Depression. Our second worst decline in history. Truly amazing! And scary. I hope we can turn this thing around soon. If you feel the need to revive at the NCAA Final Four, you’ll now be able to. That’s because Coca-Cola is replacing their top water brand, Dasani, with their top “lifestyle beverage”, Vitaminwater, in their sponsorship deal with NCAA. 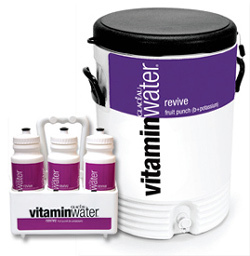 All 88 NCAA championships will have Vitaminwater’s “Revive” flavored water branded on their water coolers, sideline cups and squeeze bottles. Could General Motors bring down the Superbowl? General Motors cutting ties with the Superbowl? Johnson & Johnson ending its relationship with the Olympics? Yep, the winds of change are blowing in the sports sponsorship category. Good story in the New York Times about General Motors hardships causing them to pull way back on their marketing dollars; millions of which would have been spent on sports. Including over $30 million that GM is pulling out of ads for the Superbowl. On the heels of that news from GM, another American icon announced they were cutting back on their sports sponsorship dollars. Johnson & Johnson announced it will not be extending its sponsorship of the Olympics. J&J had been one of the top IOC sponsors, a worldwide sponsor, and originally announced they would stay on through 2012 in London. But they have decided to change course and end their sponsorship with the IOC in order to “focus on other business priorities”. With the state of the economy today, this is just the beginning. Expect to see a lot more stories like this in the months ahead. Companies are going to have to cut expenses somewhere, and many of those marketing reductions are going to come from sports sponsorships. Why do I find myself agreeing with Thomas Friedman so much? Not sure, but I like his books and I like his columns in the New York Times. His recent NY Times column offers his ideas on the proposed government bailout of the Detroit auto industry. It’s a worthwhile read, I found myself nodding a lot. I even liked his somewhat far fetched idea about bringing in Steve Jobs. It could work, right?